VANCOUVER, British Columbia, Canada, May 31, 2018 (ENS) – The Government of Canada has agreed to purchase the controversial Kinder Morgan Canada Trans Mountain Pipeline system and the Trans Mountain Expansion Project, TMEP, for C$4.5 billion. Opponents fear heavy crude oil spills along the land route and at sea. Kinder Morgan Canada will work with the board to seek a third party buyer for the Trans Mountain Pipeline system and TMEP through July 22, 2018. Due to civil society protests that drew thousands of people to the Kinder Morgan tank farm on Burrard Inlet for months and resulted in hundreds of arrests, Kinder Morgan in April suspended all “non-essential” spending on the pipeline expansion. As part of the agreement, the Government of Canada has agreed to fund the resumption of TMEP planning and construction work by guaranteeing TMEP’s expenditures under a separate Federal Government recourse credit facility until the transaction closes. The parties expect to close the transaction late in the third quarter or early in the fourth quarter of 2018, subject to Kinder Morgan shareholder and applicable regulatory approvals. The Trans Mountain Expansion Project is a C$7.4 billion construction project that will parallel the 1,150-km route of the existing Trans Mountain Pipeline, built in 1953. 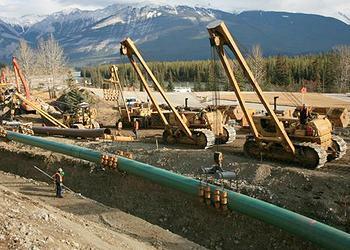 Pipeline capacity will increase from 300,000 to 890,000 barrels of oil per day. On November 29, 2016, the Government of Canada granted approval for the project. The new pipeline is supposed to carry diluted bitumen, a heavy form of crude oil, from the Alberta tar sands to the southern coast of British Columbia for tanker shipment to markets overseas. Kinder Morgan Canada says the expansion project originated in response to requests from oil shippers to help them reach new markets by expanding the capacity of North America’s only pipeline with access to the West Coast. “Our Canadian employees and contractors have worked very hard to advance the project to this critical stage, and they will now resume work in executing this important Canadian project,” said Kean. KML expects its 30 percent share of after-tax proceeds to be approximately C$1.25 billion. “The Trudeau government is spending $4.5 billion of taxpayers’ money to let the Texas company Kinder Morgan wipe its hands clean of a pipeline project that can’t find private sector investors,” she said. 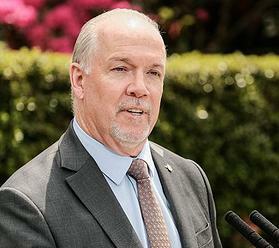 The Government of British Columbia remains opposed to the pipeline expansion because of its risk to the environment. “Tens of thousands of B.C. jobs depend on pristine coastal and inland waters. Our environment generates millions in economic activity, from tourism to film and fisheries,” the premier said. Trudeau confirmed that the agreement will guarantee the resumption of work for the summer construction season and protect thousands of jobs. During the call, Trudeau reiterated the federal government’s jurisdiction over interprovincial pipelines, and noted that the Government of Canada is confident that, with this agreement, it is upholding the trust Canadians have placed in the government to both grow the economy and protect the environment. The Prime Minister reaffirmed his commitment to work collaboratively with British Columbia on issues such as supporting infrastructure, fighting climate change, and protecting Canada’s environment and coasts. Alberta Premier Rachel Notley also spoke with Trudeau on Tuesday, confirming her support for the pipeline expansion. The protests led by indigenous First Nations will continue, organized to safeguard Burrard Inlet where the City of Vancouver is located, by the group Protect the Inlet. On Saturday, June 2, people will convene at Kwekwecnewtxw, the Watch House, before marching to the gates of Kinder Morgan’s Burnaby Mountain tank farm on Burrard Inlet. Over 2,000 people attended an emergency rally on May 29, the same day that the Trudeau government announced they would purchase the pipeline after investors deemed it too risky. 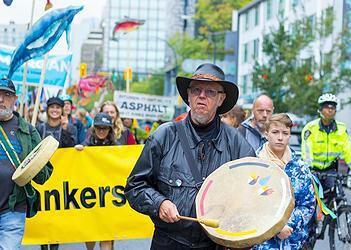 Kinder Morgan was forced to abandon the tar sands pipeline project after facing escalating opposition from Indigenous Nations and leaders, as well as thousands of British Columbians who have pledged to engage in civil disobedience to stop the pipeline. On May 24, the City of Vancouver and Squamish Nation lost court challenges over the Trans Mountain pipeline expansion. The British Columbia Supreme Court dismissed their petitions aimed at quashing an environmental assessment certificate issued by the province for the project under the previous Liberal government. The City has 30 days to appeal the ruling. The Provinces of British Columbia in April asked the B.C. Court of Appeal to decide the province has the power to restrict increased heavy crude shipments to its coast due to oil spill fears. That case is still pending before the court. Ottawa’s decision to buy the pipeline expansion project does not entirely clear away the uncertainty surrounding it, says Alexandre Moreau, public policy analyst at the Montreal Economic Institute.